I saw this on facebook, and it deserves to be told – so please re-tweet and post this on facebook to show your respects. After reading today’s Metro on the train and seeing the atricle by Hayden Smith, I was shocked by actions of these demonstrators! 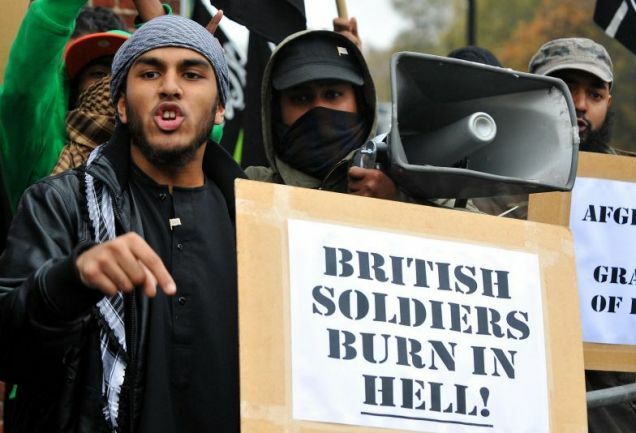 “Around 30 protesters calling themselves Muslims Against Crusades chanted ‘British soldiers burn in hell’ as the nation marked the anniversary of Armistice Day. They also held banners which read ‘Islam will dominate’ and ‘Our dead are in paradise, your dead are in hell’, as they marched from near Hyde Park. The group clashed briefly with police in Kensington, west London. One officer was taken to hospital with a head injury and two men were arrested for public order offences and one for assaulting a police officer. The situation threatened to boil over further when around 50 members of the right-wing English Defence League staged a counter protest and police battled to keep the two groups apart. Politicians, relatives of soldiers killed in Afghanistan and Islamic groups condemned the protest. Christine Bonner, whose son Darren was killed by a landmine in Helmand province in 2007, expressed ‘disgust’. ‘There are people like myself that, at 11am today, were remembering the lives of our children, and then there are some people doing something so hurtful as that. It is atrocious,’ she said. Labour MP Khalid Mahmood described the actions as ‘ridiculous and despicable’ and Conservative MP Patrick Mercer said the group had ‘scorned’ the sacrifices made by thousands of Muslim British soldiers. But, to be honest…. the ‘rest’ of the government disagree with the rise in tuition fees, so I really don’t understand this statement at all. As safe to say, the majority disagree with the rises – after a conversation in work last night with two gentlemen they were fearing the worst for their children’s future, and both had set up “college funds” so that they can support their children through university, because they know in years to come the chances ofgoing/getting into university and coming out with debt is going to leave their children in debt for the rest of their lives. I guess, I should start saving now! Get the f*** out of our country then you muslim scum.